Warning: Spoilers ahead for the already-massively-spoiled Batman Incorporated #8. We've already been told, from the lips of Batman Incorporated writer Grant Morrison, that Damian Wayne dies a hero in today's issue of Batman Incorporated. 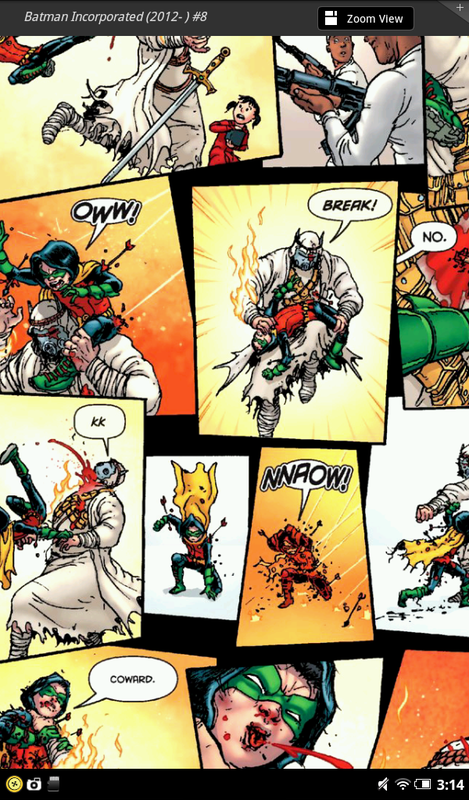 Of course, given the degree to which he's spent years establishing Damian as nigh-unbeatable in a fight, the question of how that might happen is one that fans have been wondering basically for as long as there's been rumors he wouldn't make it out of Morrison's run. 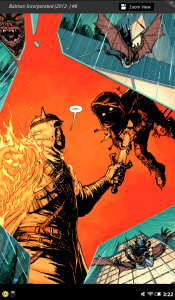 Well, there are shades of Bane in the issue and those who were concerned about the good taste of showing the death of a ten-year-old boy weren't without cause; the battle isn't gratuitously gory or anything, but it isn't for the weak of heart. Battered by his genetic twin and with arrows and bullets rained down on him during the fight, Damian calls out for his mother or father for help repeatedly throughout the course of the story--but they all fall on deaf ears, as Talia (his mother) has Batman (his father) chained inside of a safe at the bottom of a pool, and it's a full issue before Bruce can free himself and even attempt to come to the aid of Damian, Red Robin and Nightwing, who are facing off against Leviathan's forces in Wayne Enterprises' lobby, with a little help from Ellie, a recurring background character from throughout Morrison's run. It's Ellie whose life Damian saves with his final act, as she has taken possession of the world-bomb trigger, the MacGuffin he's trying to acquire, which he puts down to fight Damian and Ellie steals to ensure the villains can't use it. She understands the gravity of the situation--that he died to save her--but whether she'll continue to recur for the rest of Morrison's story (four issues left after this) is a question with no answer just yet. As is whether Batman will torture himself with the knowledge that it's his choice to help this poor girl that ultimately led to her being in the right place at the right time for Damian to die saving her. It's interesting; while it's unclear to what extent Knightfall "counts" in the New 52, the imagery from that story (in which Batman was defeated by Bane and briefly turned the cowl over to Jean-Paul Valley a homicidal vigilante) can be seen here; Damian's hulking clone is not only reminiscent of Bane, but actually tries to use the same back-breaking move on Damian that Bane used on Bruce. In the end, the robed figure ends it with his sword, while on fire--something that's oddly reminiscent of Valley's prior identity as Azrael, an "angel of death" with knight's armor and a flaming sword. 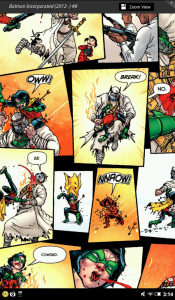 We also get a pretty obvious callback to a couple of classic comic book moments--first the death of Elektra, which is recalled anytime you see an impalement of this sort in comics, and then to the death of the first Robin, with a similar image of Batman cradling the fallen, bloodied sidekick.